In tone, apparent intent and the nerves it touches, this week’s Bollywood release October brings to mind Althaf Salim’s 2017 Mollywood film Njandukalude Nattil Oridavela (An Interval In The Land of Crabs), a low-key entertainer about a family grappling with cancer in their midst. It requires immense finesse to treat such a subject with humour, yet not be insensitive or gross. In another setting and with another theme, October manages to do just that. When the mother’s diagnosis was revealed in Njandukalude, I remember thinking: “What kind of jerk makes a comedy about cancer?” The answer came by the end of the film: the sort who understands the inexpressible, inexplicable aura that envelops us when tragedy strikes and life seems to come to a standstill yet goes on, with all the accompanying smiles, tensions and tears; the sort who understands that it is possible to affectionately laugh at people’s quirks without mocking them or their circumstances. Like Salim, writer Juhi Chaturvedi and director Shoojit Sircar are “that kind of jerk”. Their October draws us into the world of a young hotel management trainee in Delhi called Danish Walia a.k.a. Dan (Varun Dhawan), a somewhat silly, impetuous, immature, angsty, antsy, exasperating, good-hearted know-it-all that you cannot help but love. He is, when we are introduced to him, a 20-something man-child skating on thin ice with his employers for all too frequently exploding at irritants that in professional circumstances require icy “the customer (or the boss) is always right” detachment. October is a mellow drama shorn of conventionally filmic twists and turns. It is tough to explain because it needs to be felt. Through its running time of less than two hours, it shares with us the bonds Dan develops with Shiuli’s mother and siblings who are strangers to him until this personal ordeal brings them together, the support offered by those around him, the effect Shiuli’s condition has on his work and more. It is a film that appears to say little while saying so much. It is about the prospect of bereavement bringing out facets of us that we did not know existed. About the loss of someone whose relationship with you has not – or not yet – been socially defined. Dan is asked more than once whether he is Shiuli’s boyfriend. If not father, brother, boyfriend or husband, then what? Must he be one of these to mourn her? How can he explain that she was his what-might-have-been, the quiet classmate who was possibly interested in him while he was too dense to notice? In some ways his struggle to put a finger on his feelings and his inability to articulate them brings to mind Devi in Neeraj Ghaywan’s Masaan (Hindi, 2015) grieving the death of the boy with whom she had a brief amorous tryst in a seedy hotel room, a chap to whom she was no one in society’s eyes but who felt like someone to her. As were Vicky Donor (2012) and Piku (2015) – both Juhi Chaturvedi-Shoojit Sircar collaborations – October too is a sharply observant film about small joys, small conversations and empathy. As much as it is about its overriding theme, it is also about that hospital employee who chats intimately with a patient’s friend late one night because he hangs around so much that it feels like they know each other well; the mother who can confide in this boy she only just met, more than those who have known her all her life; the uncle who does not realise that his well-intended pragmatism about Shiuli could hurt those closest to her. The success of October’s writing and acting lies in the fact that each of these people is so utterly real, and the story so utterly relatable. The best cinema reminds us of our own life experiences even when our scripts do not literally match. I confess that the night after watching October, I tossed and turned in bed for hours before waking up in tears, remembering difficult questions about a beloved relative that once confronted me in what now seems a lifetime ago. Of course I am not Dan and this is not the same thing, yet October causing those emotions to well up inside me is an indicator of its resonance with realities other than its own. Like Chaturvedi and Sircar’s previous team-ups, this one too marks a new turning point in Bollywood, where the lines between offbeat and mainstream are continuously blurring. As much as we celebrate such an experimental film coming from a financially successful director, it is worth celebrating the fact that an actor as hard-core commercial as Varun Dhawan has chosen to star in it. In a filmography dominated by the likes of Student of the Year (2012) and Judwaa 2 (2017), it is interesting to see Dhawan stirring the mix at this early stage of his career with riskier ventures like Badlapur (2015) and this one. Sircar is good for Dhawan. The director mines his leading man’s innocent charm well for this role, and Dhawan himself makes every effort to efface his starry swagger and trademark cutesiness to play Dan. There are fleeting moments when the latter does peek through in his dialogue delivery, but for the most part the actor hits the nail on the head with his performance. Casting director Jogi deserves a trophy for finding October’s outstanding supporting actors. Banita Sandhu deserves another for rising to the challenge of playing a character who, for the most part, has nothing to do but be motionless. In the few minutes we get with Shiuli before she is bed-ridden, Sandhu ensures that we like her enough to stay invested in her till the end, and later brings alive even that frail creature lying helpless in bed. October is that rare example of a film in which every single actor is remarkable, every single character memorably written and acted. While each one has stayed with me, a special mention must go to the fabulous Gitanjali Rao who plays Shiuli’s mother Vidya Iyer, an IIT professor and single mother. As you watch Dan repeatedly messing up on the job, it is hard to believe that a five-star hotel would retain this troublesome fellow as long as Radisson Dwarka holds on to him, but Chaturvedi’s writing and the acting by the lovely Prateek Kapoor make Dan’s immediate boss Asthana so believable, that even that improbability comes across as probable. 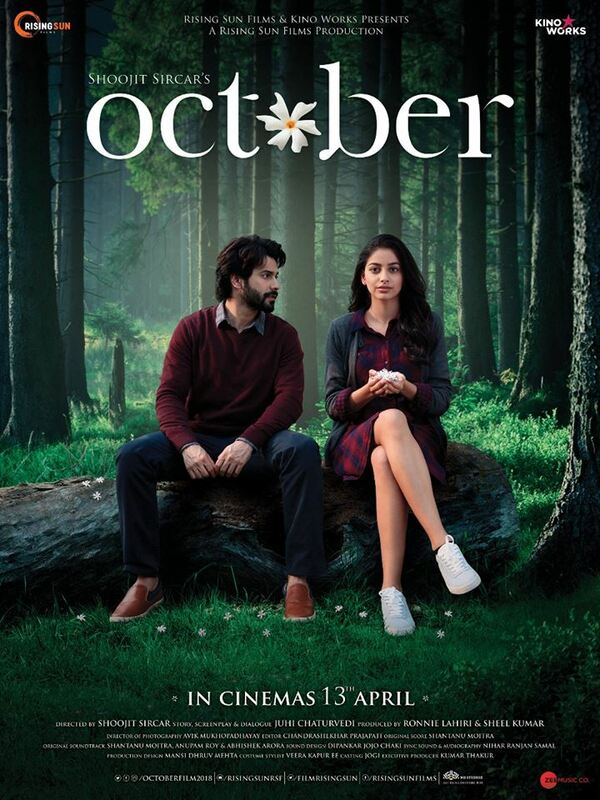 October is not a film in a hurry, its pace entirely mirroring the painstaking healing process that Shiuli goes through. Seasons change, Avik Mukhopadhayay’s camera closes in on tired faces and moves back to capture pretty pictures of a city that is a lot more than the “concrete jungle” stereotype now attached to urban spaces. Sircar gives us time to take in the enchanting detailing he offers: the bougainvillea tree laden thick with pink blossoms in a splendid full frame, the mother whose demeanour in the classroom does not betray the trauma she is dealing with back home, a Delhi that is far more multicultural than most Bollywood films set here seem to realise. The Malayali nurse (Nimmi Raphael), the Bengali neurologist (Ashish Ghosh), the Tamilian professor explaining why her daughter has a Bangla name – their presence makes October far more representative of the real Delhi than Punjabi-obsessed Bollywood usually acknowledges. Sircar’s latest film is a sweet-sad-funny saga of love, loss and coping. It has been many hours since I watched it and I am still lost in its poetic realism.